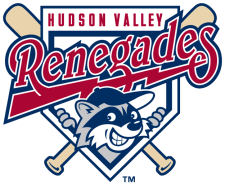 The Hudson Valley Renegades defeated the Aberdeen Iron Birds in walk-off fashion, 3-2 on Thursday night at Dutchess Stadium. The Renegades scored first in the first inning. Derek Diertrich was hit by a pitch then later scored on an RBI single by Phillip Wunderlich to take a 1-0 lead. The Renegades added to their lead in the second. Nick Schwaner left off the inning with a double to right. He would later score on a wild pitch, increasing the lead to 2-0. Aberdeen scored their first run of the night in the third inning. Michael Flacco drove home Kipp Schutz to pull them within a run of the lead 2-1. The Iron Birds tied the game in the fifth. Omar Casamayor tripled to right to lead off the inning. Schutz drove him home with a double to center, tying the game at 2-2. The game would remain tied until the bottom of the ninth. Wunderlich singled to center to lead off the inning then was replaced by Chris Winder as a pinch runner. Robby Price drove home the winning run with a single to left, giving the Renegades the 3-2 walk-off win. Miguel Sierra pitched 5 innings and allowed 2 runs on 7 hits with 3 strikeouts and 2 walks. Jacob Thompson pitched 2 shut-out innings with a hit and 2 strikeouts. Austin Hubbard picked up the win with 2 scoreless innings, giving up a hit with 3 strikeouts. The two clubs will play the second game of the series on Friday night at Dutchess Stadium. Omar Bencomo (0-0, 4.70) will start for Hudson Valley facing Justin Moore (1-0, 1.64) for Aberdeen. In case you missed it, Jake Thompson threw exactly 25 pitches — that was his pitch limit — and 22 of them were strikes. Do you know if all those strikes were looking or was he getting some whiffs? And right now they are only using him as a relever because he came outta of college right? Next season he will most likely start out at starter? There was a nice mix, and yes, he came straight from Long Beach State. I just talked to both Jake and the HVR pitching coach, Jack Giese, before tonight's game and I'll have a full story on the reaction to Jake's first outing in tomorrow's Poughkeepsie Journal.